mama elephant | design blog: October Design Team Stampede! Just showing off a couple of projects I made with this fun new release! 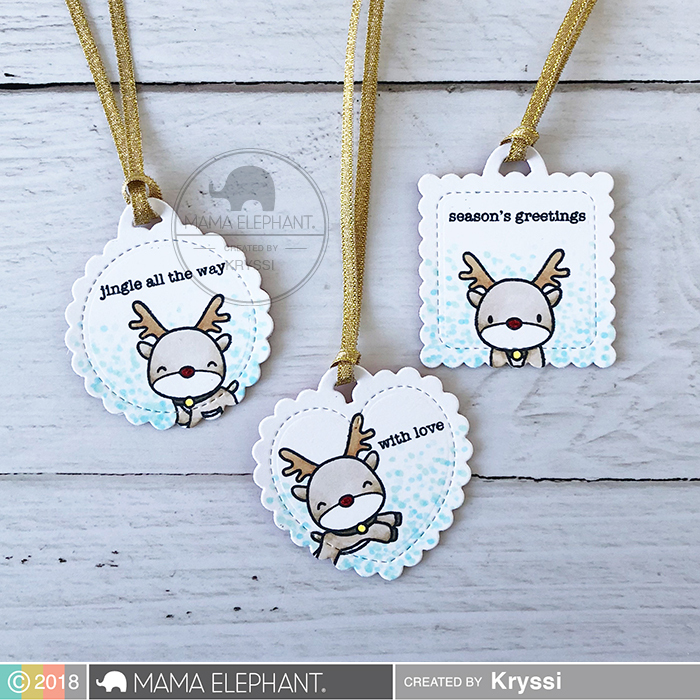 I also broke out the old timers Reindeer Games to make these tags using the new Scallop Tags Trio. Omg, such an adorable release! This new release is so cute! I love the new scalloped tag dies. I have been a long time Mama Elephant Facebook 'Liker' and shared on my FB page too. Such a cute release! Love the tags! Another lovely release, and that's really something after your 6th anniversary huge and amazing one! Can't wait to see all of the Christmas inspiration - I'm making Christmas cards myself already, too! Such a great release, everything is so cute! Love these cute and adorable images! Such a cute release. Love the adorable cards. Love everything in this release!!! So adorable! I need those tags! Once again, so any wonderful products. Too hard to choose. Love these. The reindeer tags are so cute. I follow Mama Elephant on Instagram. 1. What adorable release!!! All these projects are so lovely!!! 2. Liked your FB page as Arianna Barbara and have just shared the Stampede post on my wall right now. So darling and I am so loving the pastel choice for Xmas! Dreamy! Follow you on IG as raggiodiluc3. Just reposted the Stampede post. I love the little reindeer tags. I love making tags for Christmas. the Reindeer games from last year is one of my favorite. I stamp them all and my daughter and I have fun coloring them. Now we can use them on our tags! Another great release! It makes me so ready for Christmas! I like you on FB and shared the release. (but I don't tweet - even tho I love birdies! haha). Awesome release! FB, Twitter, and IG follower here! The tags are really sweet! Those reindeer tags are so cute! This is such a lovely release with super awesome inspirations! :) Loved hopping along! Very cute designs. I wish I have all the update designs and colors. Such cute and wonderful products I really love this release. Gorgeous inspiration! Loving the scalloped tags! I think the Christmas release is always my favorite. This one is fantastic. So many fabulous and sweet new products! Amazing inspiration projects too! So cute!!! Can’t wat to see in person. Thanks. Great release. Thanks for sharing! And the creation are all fantastic. Such a cute release! Can't wait to see more! Wonderful release. I love so many parts of it. Really like the Inside Pop Card Holder! Adorable carolers. Love the giftcard bag pop up. Great release as usual. I love the Happy New Year! Love the release! I can’t wait to get my order! I follow on Instagram b/c I don't want to miss a thing! Also this new release rocks! I A-D-O-R-E you on Instagram. What an adorable release!! Love it!! These little tags are SO cute! I love the little faces on the deer, and you have really made them festive with the beautiful colors! Another GREAT Release!! I love it ALL! This release has been so adorable (as always!)!! I LOVE your little reindeer tags!! They are the cutest things ever, specially with those scallops! ADORABLE new products, loved everyone's cards!!! Liked and Shared on my FB page! I love the cute tag sentiments! I love all of your new release but the Holiday Bitties is my absolutely favorite!! Such cute little tags, a really wonderful release. Great release! Awesome inspiration along the hop! I love these little bitties and tags! This is a really cute release. Love the little words and the Holiday Bitties. As usual this is another AMAZINGLY CUTE RELEASE!!!!! I follow you on Facebook: Meghan Kennihan and will share! So cute, makes me want to get crafting right away. I want that reindeer set! Such a cute and fun release, especially the Holiday Bitties. What a fantastic release. Love all of the adorable gift tags. Fan on FB and shared. 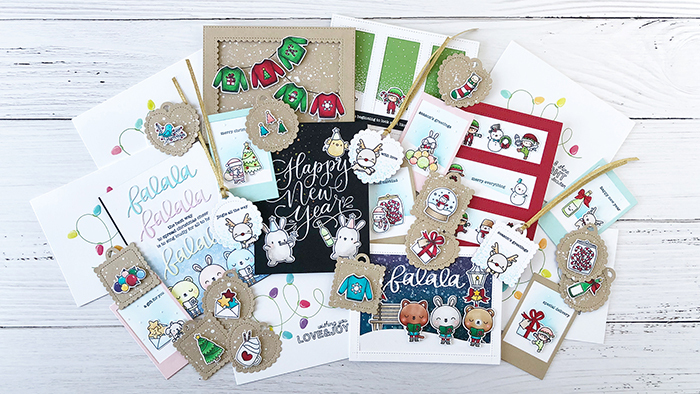 So many delightful stamps and dies! I'm inspired! I'm excited about the new release and all of the fun new stamps and dies! I love that big scripty Happy New Year stamp! And I follow you on Facebook! Yay! More big scripties! And I love the tags. I have a tag-making party every year. These will be a big hit! I love when Mama Elephant has a stampede! So many great ideas! Your stamps are as always original and magical. My favourite is "Bright Lights". Beautiful projects from the designers. Liked and following on Facebook. Such an adorable release! Liked you on Facebook. I adore your holiday releases!! The lights, little sweaters, and Christmas bitties make my creativity go into overdrive! Amazing and so much fun. I can hardly wait to see November's release. I LOVE all of your Christmas release! Congratulations on your new release! Lots of exciting products and nice project samples by the DT featuring these new products.-Maria Giselle B.